It’s here! My online class on how to create your own amazing resin geodes. It’s perfect for beginners. I’m so excited to be able to share details of my class with you. I had such a blast making it and I think you’ll love taking the class and making your first resin geode right along with me. 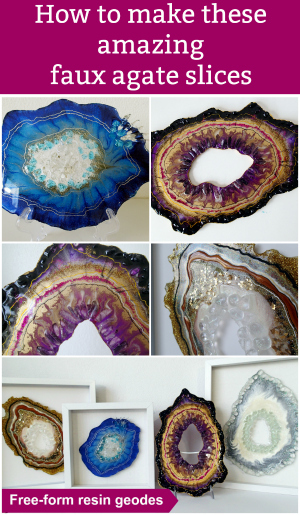 A course for resin beginners looking to create amazing geode inspired resin artworks. Maybe you’ve dabbled with resin before, perhaps just some simple clear coating on coasters or artwork. 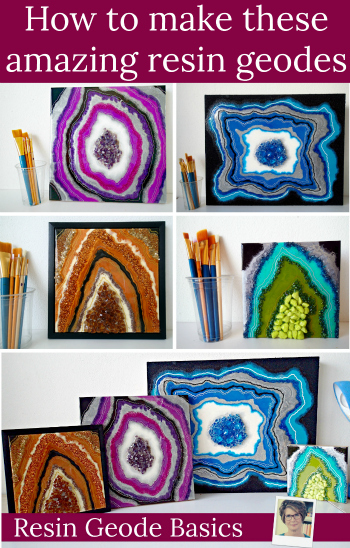 Now you’ve discovered how amazing it can be and seen some of the geodes made from resin and want to make them too. But resin and the geode materials are expensive. You could dive right in, spend a lot of time and money and end up with a piece that just didn’t work out – and all those materials are wasted. Taking this class will help you avoid those mistakes and leap up the learning curve so that your first piece will be amazing. In the class, we will cover a wide range of topics concentrating very much on the basics of creating resin geodes. It assumes a previous basic knowledge of resin working but we will still cover safety and supplies needed for working with resin. You’ll learn how to pick the best surface, what materials you can use and where to get them, how to keep your resin layers from bleeding and moving too much, and how to tease them into the shapes you want for your resin geode. Once you have the basics and your first resin geode completed, your creativity can kick in without fear of failure and you’ll be able to take it so much further, create amazing designs you will love. Who should take this resin geodes class? It’s probably not the right class for you if you are already experienced in using resin and have created resin geodes successfully before. This is more of an entry-level class. Safety equipment recommended: Gloves essential. Respirator recommended for those who may be sensitive to fumes. I hope you will join me. I’m looking forward to sharing my knowledge and experience with you. You would make my day if you would share this class on your social media and chat groups with people you think might be interested. Or use the image below to Pin to your Pinterest boards. Thank you! Hello. If I join your class, can I look at the videos anytime I choose? Over and over again? Are they forever so I can review periodically? Thanks. Look forward to hearing from you. Hi Rebecca. Yes the videos are there permanently. There is no time limit. It’s ‘lifetime’ access for as long as the site remains there. Hi Deby… I was looking at this course back in June and I’m sure it was less expensive then. Has the price increased? No change, the class has always been the same price.